"The majority of my albums are in my Windows Media Player and I would like to transfer those albums to my iPod. Now I don't know how to. All I know is that WMA is not compatible with Apple iPod. So how do I rescue my songs? I tried to use limewire to download free music but it is a mess." If you meet the same problem, you got the right place! 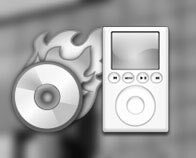 The following tutorial details how to put both protected and WAV (Windows Media Audio) music files to iPod. If the WMA files you are going to play on your iPod are unprotected, you just select and drag them into iTunes Library and they should be automatically converted to whatever iPod format you selected in iTunes preferences for importing. If they are WMA files protected by DRM, it is not that easy. You need to use some software to strip the DRM off your WMA files and then convert the WMA files to the much more widely-supported MP3 format. Note: As with any transcoding, the quality will go down. But if you've got a lot of WMA files you'd like to get on your iPod, this solution would do the trick. Download TuneClone and install it. After launching TuneClone, click the "Settings" button. In the pop-up dialog of "Options", you can specify the "Output Folder", "Output Filenames", "Output Format" (here we choose MP3), etc. for the output files. Tip: You can get the output protection removed MP3 music folder by clicking the "Folder" button after the whole process. Create a new playlist and drag into it the WMA files you are going to enjoy on your iPod. 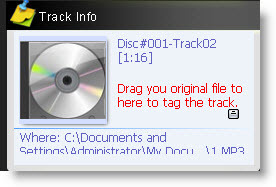 After that, click the "Burn" button and select "Audio CD" from the drop-down list. 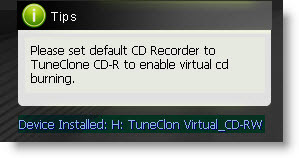 On the right panel of "CD Drive", click "Next Drive" to locate the CD drive to TuneClone's Virtual CD Burner. Then, drag the playlist you created just now to the "Burn List" and click the "Start Burn" button to start burning the playlist. While the burning gets started, TuneClone will automatically convert the WMA playlist to MP3 files. You can open the manager screen to show all the converted music files. Note: If you get the output files formatted as 01-1.mp3, 01-2.mp3, etc., please click the output MP3 songs in the manager screen and drag the counterpart original WMA songs to the "Track Info" panel of TuneClone one by one. The information about the artist, album, title, etc. will be changed accordingly. It would be a time-consuming process if you are burning a big collection of music. However, since Windows Media Player 11 doesn't support CD-text burning, this seems to be the only way to get the information back. After you get the output MP3 files converted from the WMA playlist in your Windows Media Player, you can now begin to transfer the MP3 files to your iPod with the sync of iTunes.